Last week, bank stocks did terribly. Fifth Third Bancorp (NASDAQ:FITB) fared particularly poorly. FITB stock tanked nearly 15% between Tuesday and the end of the week. In just four days, Fifth Third Bancorp stock dropped from its highest levels since September to near its 52-week lows. It isn’t just FITB stock that is suffering lately. Commerce Bancshares (NASDAQ:CBSH) dropped 10% last week, while KeyCorp (NYSE:KEY) and Huntington Bancshares (NASDAQ:HBAN) both fell close to 15%. Arguably the three most comparable banks to Fifth Third, they are also, like FITB, all large Midwestern banks. What’s going on here, and are these regional banks, including Fifth Third Bancorp stock, buys at this point? The interest-rate yield curve inverted in a big way on Friday. This move in bond yields presumably drove the considerable selloff in the stock market on Friday, with banks falling particularly hard. It’s not difficult to understand why. A yield-curve inversion occurs when short-term interest rates become higher than longer-term interest rates. This rare occurrence signifies that investors expect declining returns and inflation going forward. Historically, just about every time short-term interest rates cross long-term ones, the economy goes into a recession. Most recently, we’ve had yield-curve inversions in 1998, 2001, 2007, and now. The 1998 inversion didn’t immediately lead to a recession, but 2001 did turn into a recession, and we all know what happened after 2007. Bank stocks are highly vulnerable to sentiment. When people think there will be a recession, banking shares tend to fare very poorly. Investors expect that banks will suffer rising loan losses as consumers and companies struggle to pay their bills. Additionally, loan demand tends to decline during recessions, further hitting banks’ earnings. Interest rates and banking stocks are showing that investors aren’t buying what the Fed is selling. The market clearly thinks that the December rate hike was a big policy mistake, and that the Fed risks acting too aggressively, sending us straight into a recession. Still, investors have to decide whether this consensus opinion makes sense or not. Because, if we manage to avoid a recession in the near-term, interest rates will normalize and bank stocks will soar. Those who have read my columns before may know that I like banking stocks. The sector has underperformed over the past year, as interest rates have not been in-line with expectations. Throw in fears of a recession, and it’s clear why investors have been bailing on financial stocks. That’s left the sector exceptionally cheap. There’s a bunch of high-quality banks trading for under ten times their earnings and near their book value. Even amidst such cheap competition, Fifth Third Bancorp stock still stands out. At the moment, it is selling for just 8.2 times both its trailing and forward earnings. It’s also down to just 1.1 times its book value. It’s quite strange for a well-run bank like Fifth Third to trade so close to its book value. FITB is currently earning a 1.5% return on its assets and a greater than 14% return on equity. Median figures for national banks are closer to 1% and 10%, respectively. 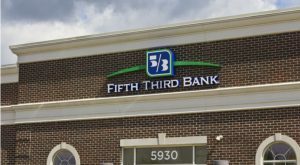 Although the operating results of FITB are much better than those of the average bank, Fifth Third stock is being valued as though it is a mediocre franchise. As a result, investors have the chance to earn standout returns from FITB stock in coming years. Over the long haul, bank investors should expect to earn something close to a bank’s annual return on equity divided by a bank’s price to book value ratio. Thus, if a bank earns 14% on equity and investors buy its stock at book value, they can expect something like 14% compounded annual returns. With FITB stock currently slightly over its book value, it should generate something like 12%-13% annual returns. At this point, if you think we’re heading into a recession soon, then you should want to stay clear of FITB stock and other regional banks. Bank stocks tend to drop when recessions hit, even if they are cheap already. Right now, though, economic data still looks quite strong. For example, recently announced GDP growth was solid. The market appears to be well ahead of the economic data; there’s little sign that the economy is in serious trouble yet. Although the economy will likely grow more slowly in 2019 than in 2018, that doesn’t necessarily mean the U.S. will enter a recession. If the economy continues to grow modestly, bank stocks will come roaring back in a hurry. With most of the Midwestern banks trading around 10 times to 12 times their earnings, FITB stock stands out as a value pick, trading at eight times its earnings and offering a 3.5% dividend yield. Article printed from InvestorPlace Media, https://investorplace.com/2019/03/fifth-third-bancorp-stock-is-a-strong-buy-following-its-recent-plunge/.